As we heard last week, Twitter made a bold move regarding its ecosystem, stating that third-party developers should no longer try to compete with Twitter on native clients; instead they should focus on things like data and specific verticals for Tweets. In the email sent to developers, Twitter said that some 90 percent of active Twitter users now use official Twitter apps on a monthly basis to access the service. Social media analytics company Sysomos decided to track Tweets on the day that Twitter made this announcement to determine if there was any truth to this assertion. 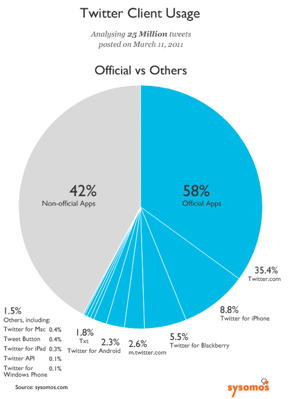 Sysomos analyzed 25 million Tweets last Friday and found that 58 percent of Tweets were sent from official Twitter apps, and 42 percent of Tweets were sent from third-party clients (or non-official Twitter apps). The analytics company highlights the trend that third-party clients are losing marketshare to Twitter clients, as the communications platform expands its offerings, and acquires third-party clients. In June 2009, a Sysomos report showed that 55 percent of Tweets were made using non-official apps, and as we learned, that number has dropped to 42 percent. 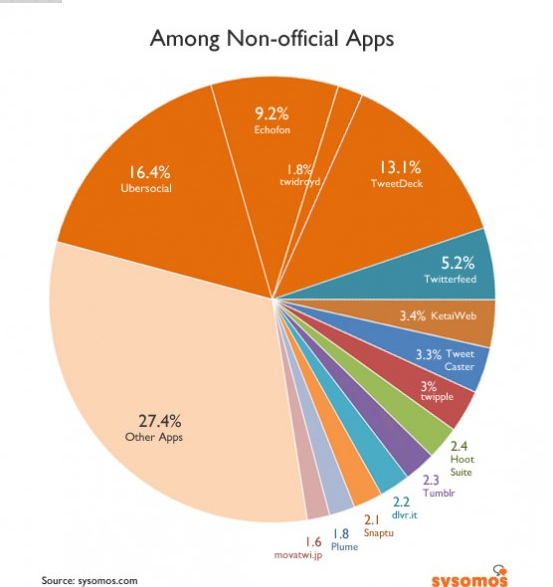 Of the outside clients, the most popular apps were in the UberMedia family including TweetDeck, UberSocial and Echofon. Broadly, Tweetdeck accounted for 5.5 percent of total tweets, and out of all the non-official apps, Tweetdeck took 13.1 percent market share. UberSocial has 16.4 percent share, and Echofon saw 9.2 percent share. It’s important to note that UberMedia, which has been collecting Twitter apps to create a third-party client conglomerate of sorts, recently scuffled with Twitter over privacy issues, policy violations, trademarks and more. UberMedia subsequently fixed the problems, changed its name and everything seems to be placid between the two companies for now. So why are Twitter’s projections of third-party client usage so different from Sysomos’ analysis? Twitter’s number focus on the total number of users per month whereas Sysomos analyzed Tweets sent, claims the analytics company. But here’s the key statement: there could be many Twitter “official” users who are not very active, which is causing the skew in numbers. But in the note to developers last week, Twitter did state that the 90 percent included “active” users. So the question is what constitutes an active user? Daily use or weekly use? Or is it monthly? Yesterday, Twitter released updated stats on its growing network, revealing that 460,000 new accounts are created per day on average. That’s millions of new users per week. But it’s unclear many of these are active? It’s an answer that may be one of the pieces to the puzzle. Another reason for the skew is that many Twitter users use both third-party clients as well as Twitter.com, or Twitter clients to send and track Tweets. There could be a good deal of overlap. Sysomos contends that the active, power users are choosing TweetDeck, UberSocial, Seesmic and other popular third-party clients because they are more feature-rich. These clients also integrate with other social networks, such as Facebook and LinkedIn.